The Route 220 Corridor Study was adopted by the Roanoke County Board of Supervisors on November 13, 2007, to address transportation and growth issues along this corridor. The Route 220 Corridor Study Area begins at the southern limits of the Suncrest Heights subdivision and runs southwest along Route 220 to Franklin County. The study area consists of 1,384 acres of land, which is rural, predominately with single-family dwellings, some commercial and business properties and several churches. Access to the Blue Ridge Parkway is located 1.5 miles to the north of the study area. View a map of the Route 220 Corridor Study Area. 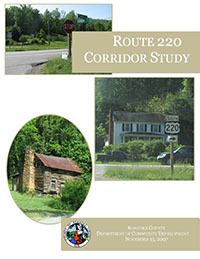 For additional information on the Route 220 Corridor Study, please contact Tammi Wood at (540) 772-7522.